So tsteigs recent posts on Back Yard Spectra Tests got me re-envigorated to find a good knot for Dyneema line. The back story is that I had a line break this last winter when I was snowkiting in the back-country. I tried some simple knots to mend it back together, but they all slipped out. Fortunately I only had about a mile to hike out, but it made me realize I needed to find a better solution in case it ever happened again. This summer I started doing some testing on various knots and quickly realized that Spectra/dyneema is not easy to tie knots with. It is so slippery that most traditional knots just want to slip out. The solution became more difficult to find than I was expecting. 1. Relatively easy to make, so I could remember how to do it and be able to make it when my hands were cold. 3. Relatively strong - a knot that wouldn't slip out with about a 200 lb load so that it could be used on a front line if needed and allow you to limp back home. After quite a bit of research, the long and short of what I found was the following knot, designed by a guy specifically for Dyneema/Amsteel. It has been called a Modified Carrick Knot on some forums, though the originator calls it "The First Bend". I tested the knot the last couple of days and found it did an excellent job of holding my weight (about 200 lbs) without slipping - better than the triple fishermans knot which many have claimed to be one of the best knots for dyneema. I found the First Bend to be superior in terms of holding strength as well as simplicity to make, and it also uses less line. So I personally think that this knot is the way to go. At any rate, hopefully this is of some use to someone out there and will save them some time trying to find a good solution to the problem. I hope to never have to use it, but its good to have in your bag of tricks, just in case you do. FWIW, I would also recommend carrying a set of universal pigtails with you that you could add back to the shortened side to make up for the 3-4 inches you will lose in the knot. And if anyone else has experience with good knot for emergency kite line repairs, I would love to hear about it. Thanks Nate I had the same problem back in October last year. Tried a double fishermans knot twice failed immediately. Had to end the session at least a couple of hours early. Slingshot Turbine 15m, Best Waroo 13 m, Peter lynn escape 11, Best Nemisis 9, Best Waroo 7m(brought back to life for IBX 2018, Ozone frenzy 11(Franken kite), HQ apex 6.5 (died IBX 2018 fly in peace) , several TT' s, SB's, PL Bigfoot XT, 600 Polaris snowmobile to get me there! I can only hope that if I ever need to repair a broken line I'm fortunate enough to be stranded in a place that offers a strong cellular signal on a 4G network so I can dial up Youtube and pray for the best. I'll never remember how to do that. That was a great video Nate, and thanks for taking the time to put that together. Superb knot! As a yute I used to spend time with my dad tying knots each week. He would make up assignments for me and I would have to research the right solution. Things like: "You are in the woods with just some hemp rope and you need to lash some logs together to drag them out. The knot you use needs to be something you can throw and later take apart" or something along those lines. 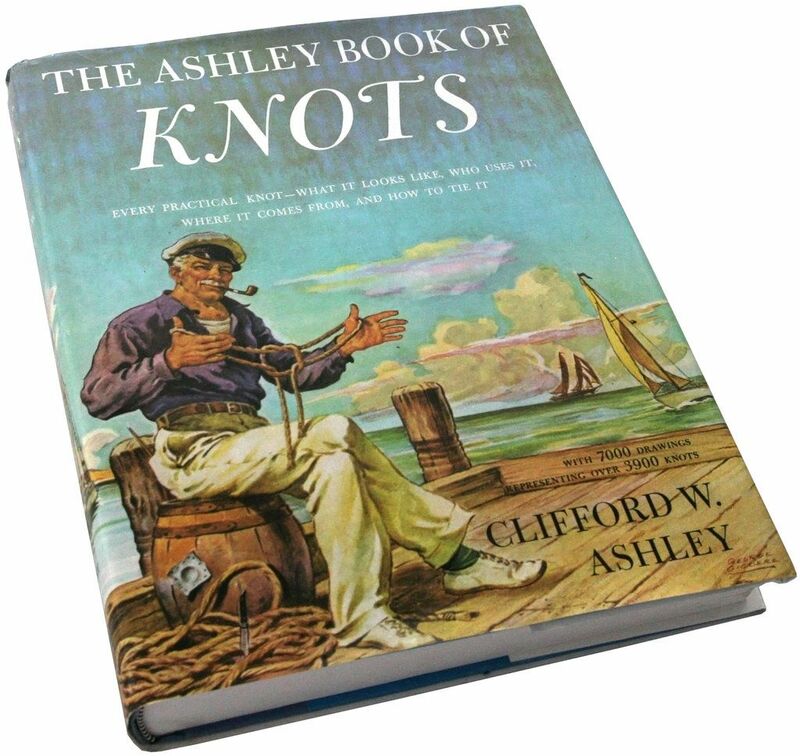 We had several books, the favorite of which for me was the venerable Ashley Book of Knots. Beautiful drawings and cool descriptions. Made a young wippersnapper feel like he was on a clipper ship! If you are flying hollow core line--everything but Q-Pro--carry a wire fid and a 8-inch pigtail or two zipped into your jacket. Splice the line together at the break and note the length of the splice. Add that pigtail to the repaired line. Add a knot to shorten the pigtail to the length of the splice if needed. Reattach line. Untangle lines, launch kite and fly home. Splicing is stronger than any knot you will ever tie. I suspect all would agree on the fact that the splicing solution is the best solution if you can pull it off in the conditions. As a Utah guy myself, I did take note that the person posting the problem was from CO and did so in February, and the guy who answered was from FL. Splicing is only something I've tried in the summer. In the middle of a snowkiting session in the Rocky Mountains? Gloves or mits need to stay on most all the time or you've got problems that will have you forgetting you're even kiting. All that said, I'd love to hold the skills to pull off a field-splice, but it's a non-starter in serious winter conditions. Mood: Is he using the same wind we are? "All that said, I'd love to hold the skills to pull off a field-splice, but it's a non-starter in serious winter conditions. " Maybe we can have a completion: Splice while drowning off Florida versus Splice while getting frostbite in CO/ UT. As long as we don't end up with a Darwin Award winner. That is all we need is a viral video to show up of someone winning a Darwin while repairing a kite string. Point taken. I don't think I could splice line with gloves on. I have done it in the field with great success, but it was in mild conditions and bare hands. Of course that was also 20 years ago when I had less backup gear. These days I'd probably wrap it up, walk back to camp and switch gear. Field repairs are best done the next morning when the winds are puny and time is plentiful. Ya, so I think if you practice the knot a couple of times, it is not quite as complicated as it looks. Once you get the 1st loop right, its really just a series of over-under-over's with a little bit of a finish. What I planned on doing was saving the step-by-step images from the guy's website I gave a link to. Either save them down to my phone or print them out, and keep in a mini-pocket somewhere. I think between trying it a couple of times and the images as a reference, I could get it done - although I haven't had to do it in the real world yet. Did talk to a guy in Durango who it worked for. As a survival knot just to get you back home - I think it would be a little easier than a full-on splice repair. When my lines broke the 1st time it was in the winter - probably in the 20's and blowing. I had to put snow on the kite to settle it down and that allowed me to work on the lines. I tried tying the line twice and on the second failure, I gave up. It wasn't fun having gloves off but was manageable. I don't think tying one good knot would have been any more painful than than tying 2 failed knots - but I'd agree if is zero degrees and blowing 30mph - it would be tough to do pretty much any kind of repair. Maybe carrying extra line or lines might be easier?? Or even little pig tails of line with a loop on each end. You could tie knot in the flying lines and larks head in the splice. Just thinking out loud. Either way, knowing a knot that works can't hurt either. I have used a figure eight knot with good success. Very easy to tie and held up until replaced. Take both ends of the break and align so that the working ends and break are parallel then tie a figure eight knot as you would for a stopper or adjustment knot with the two lines together. I did this on three of my lines at once when a curious skater severed them. Used for the rest of the session, I'm hoping the skater fell in a hole! TEDWESLEY did you ever try it with an in line figure eight [put an "8" into one end and then trace it back with the other end]? This knot has always kind of been my plan if I needed to repair in the field but I do not recall every putting one under "kiting loads." I dusted the rust off of my Brummel Splice skills last night and I do not think that I would want to try and do one in wind/ snow/ rain/ ocean. I'm with cere (read under) bite, the "water knot" based on a fig-8 as compared to a simple overhand knot. There are several knots similar to this used in fishing that also deals with really slippery and wet lines. Does this knot NOT hold? One advantage of the figure eight style knot is that it can be untied. In my case I replaced the set rather than make three splices and a length adjustment. Good question - I actually did test a Figure 8 knot a couple of times and found that it would slip out at full load (in my case I was testing up to about 200 lbs). Unfortunately the scale I had only went up to about a 100 lbs. The Figure 8 was fine up to there. Beyond that, once I got close to having all my weight supported by the line, it would start to slip out. My guess is that a Figure-8 knot would probably work for most situations, especially if you were repairing the back lines where loads are pretty low. Even a front line my guess is you are rarely going to load more than a 100 lbs, so this might be overkill. But I also know it stinks to put all the work into fixing a line only to have it come apart 50 ft down the road, so I'll probably stick with one that I feel pretty confident won't slip. What I found once I started researching this more is there does seem to be the consensus for folks who work with Spectra/Dyneema type lines: that standard knots like the double or even triple fishermens (as Anthony mentioned), Figure-8, Carrick, Zeppelin and other normally-secure knots just don't seem to hold as well with UHMWPE type lines. I would only use a knot as an emergency repair. Even the best knot removes 50% or more of the line's strength. Splicing is the only way to approach 100% strength. The problem results from the sharp bends in knot formation causing the filaments to carry unbalanced loads.